A small, easy-to-use handvice can be readily made out of a one-inch thick hardwood limb. Such a vice is very handy in stone and bone working. It can be wedged between two rocks or in a tree trunk to provide a very steady holder for small projects (arrowheads, fish hooks, etc.). Cut a 4" to 6" length of hardwood limb approximately 1" thick. Use ash or hickory if possible, but any wood will do in a pinch. Whittle a rounded or pointed end on piece. Choice of shape would depend upon what is to be held in jaws of vice as this end will end up as the jaw end. Split piece lengthwise into two equal halves. Use knife blade and rock hammer to split wood. 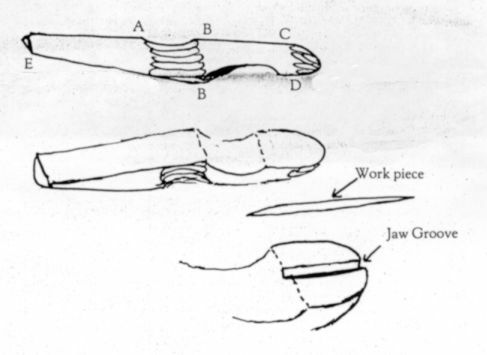 From a point beginning at "B" and going toward the end opposite the jaw, taper the split out flat edge of each piece as in diagram below. Label this tapered section "B" - "E". Taper approximately 1/8" off of the "E" end, tapering off to 0" at "B". From a point approximately 3/4" back from the jaw tips, and extending back to point "B", cut out a half round section approximately 1/8" deep. This is to give a slight degree of spring tension to jaws. Do this on both pieces. 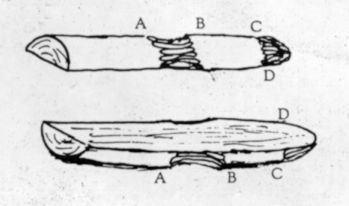 Place both sections together and wrap with cordage as in diagram below. 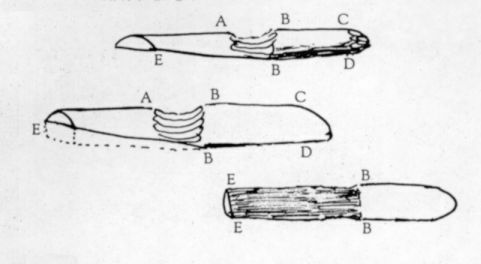 Carve a wooden wedge approximately 1" long and 1" wide tapering from 0" to 3/8" or more if jaw spread is more and a thicker wedge is needed to hold work piece. Hammer point of wedge into crack between both pieces using wedge to open this crack and close jaws on work piece.